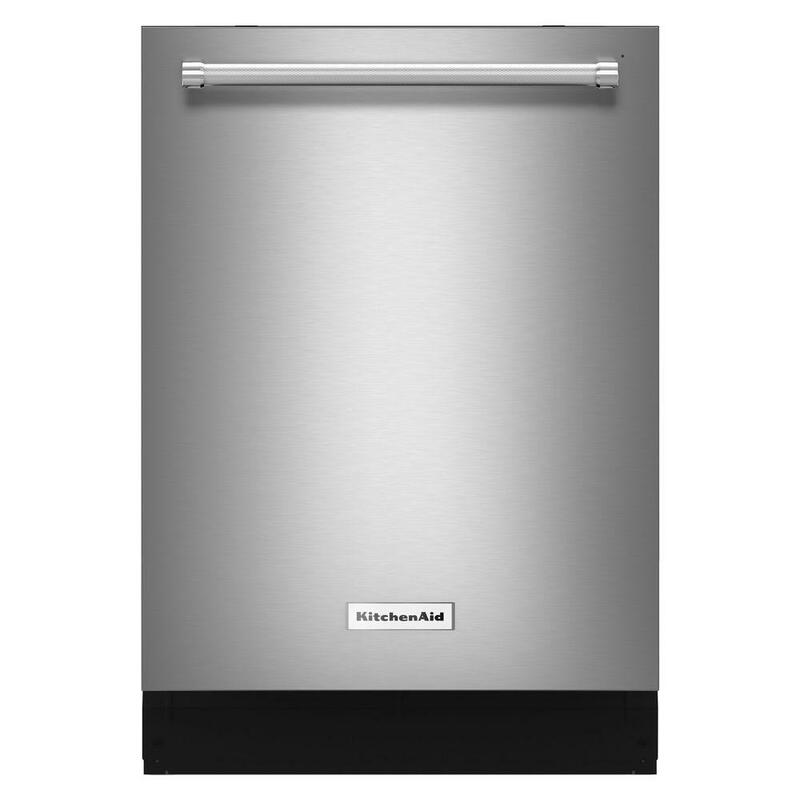 This KitchenAid Top Control Dishwasher comes with breakthrough Ultra-Fine Filtration that continuously cleans the wash water for superior performance, even with the heaviest loads. It also features a ProScrub Option that uses 40 targeted spray jets to make quick work of stubborn messes. The Advanced ProDry option delivers the best drying performance by circulating the air from a heating element, so your dishes come out dry and ready to use or store. Is the count down timer visible when the door is closed? What's the difference between this one and the KDTM354DSS? Dishwasher seems to be locked. In the panel it looks like a red lock, what does this mean? This product has an accident prevention feature to keep the machine from turning on unintentionally and this is countered by pressing and holding the control lock button for 3 seconds, then it will become unlocked. D3rd rack at the top??? This model does not have 3rd rack but has adjustable top rack is needed. Top Control Dishwasher in Stainless Steel with Stainless Steel Tub and Clean Water Wash System, 44 dBA is rated 4.6 out of 5 by 2548. Rated 1 out of 5 by Max15820 from 3 1/2 years later, electrical fire Purchased unit in Sept 2015, 3 1/2 years ago, it was a great unit, until the smoke and I mean a really awful and rancid smell came from the dishwasher. I was within 2 feet of the dishwasher when this happened, a few pops could be heard and then the smell. I even purchased a 3 year warranty from a very large retailer. I am glad I was home or who knows what would have happened. Oh well. Rated 1 out of 5 by Disappointed customer JR from The worst This is the worst dishwasher I have ever seen. We spent a fortune on this unit and still have to wash The dishes before loading them in. It needs weekly preventative maintenance. Make sure there isn’t even a grain of rice bc that stuff gets stuck in the sprayer arms. It’s near impossible to get them completely clean. Besides not getting dishes clean it takes hours to run And now the slide mechanisms for the top and bottom racks have completely disintegrated spewing ball bearing all over the place. Rated 1 out of 5 by Jeff from It looks real cool. The only problem is the power does not come on so it doesn't actually wash di... It looks real cool. The only problem is the power does not come on so it doesn't actually wash dishes. I ordered this on May 29, 2017. It is now June 29, 2017, and after 1 delivery trip, 2 visits from the plumber, 3 visits from the installation team, and a repair visit, I am now waiting for another repair visit which is scheduled for July 7, 2017. My expectation is the repair person will determine something is wrong that will take another week or two to make right. After that I can call and schedule the installation, which will be another week or so. My old one didn't look as nice but it always worked. I don't know what I was thinking replacing a good but dated dishwasher with one that doesn't work. On top of that, I now spend 20% of my life waiting for robo-calls and appointments. Some of these problems are actually forgivable, but a lot of it can be blamed on terrible process and practices by home depot.com. I would never again buy anything more complex than a claw hammer from home depot.com. Rated 5 out of 5 by Nate from Super quiet and cleans very well. I sometimes don’t even... Super quiet and cleans very well. I sometimes don’t even realize it’s running!!!! Installation went quick and they did a tremendous job. Highly recommended.